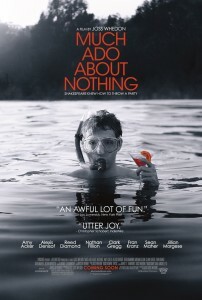 Much Ado About Nothing epitomises the Indie film. Before I start discussing this film, I feel I should reiterate something that is perhaps often overlooked; Much Ado About Nothing is a black and white adaptation of a William Shakespeare play, directed by Joss Whedon. As much as these two names are often revered and celebrated for their timeless stories and witty dialogue, and for many they will be the sole reasons for wanting to see this film, when it comes down to it, it is fair to say that the audiences for their specific texts (like those of other black and white films) can be made up more of cult followers than mainstream viewers. As such, Much Ado About Nothing won’t be of interest to everyone, and it is highly understandable why it initially went for the festival circuit rather than riding the tail of Avengers popularity with a wide release. That said however, for those who are interested in either Wheden or Shakespeare, Much Ado is the perfect combination, and is a great place to start for anyone who wants to give more niche films at try. Those with haunting memories of studying Shakespeare at school should remember that he wrote plays to be performed by actors and not novels to be read out monotone in the classroom, which is generally where most people’s dislike comes from. On the screen these characters are more than understandable, they truly come to life, and in a way which successfully manages to merge the traditional text with a contemporary setting. Although it can take a few minutes to acclimatise to the 400 year old dialogue, the characterisation of each performance allows the message and feeling to come across, even if individual words can get lost in translation. Despite not having written the original script himself (although he did adapt it to the film’s abridged version), Whedon has no difficulty in directing his actors reciting the Shakespearean dialogue due to the simple fact that the two wordsmiths are so compatible. Throughout their careers both have been noted for creating characters who are witty, sarcastic, eloquent, and above all, perfectly rounded. Ye olde language aside, I don’t think there could ever be another writer more suited to being adapted and directed by Joss Whedon. Unlike other Shakespere adaptations which clash the historical text with contemporary Hawaiian shirts, Whedon has instead opted to dress his characters in more timeless attire; the men soon forget about the wars they have just been fighting and wear classic suits for example, and the women don simple but elegant dresses. In fact almost all the visual clues, from the monochrome finish to the architecture and decoration of Whedon’s own home in which it was filmed, lend a timeless appearance to the film in which the the text itself seems perfectly placed, but which renders the sight of modern technological gadgets far from intrusive. Beatrice is played by Angel and Dollhouse’s Amy Acker. Obviously fans of Whedon’s previous work will smile at the appearance of familiar faces, but it is clear that each has been chosen specifically for their individual roles. None of the leads are so familiar they cause a distraction, and the unique style of the film allows even Alexis Denisof and Amy Acker’s portrayals of Benedick and Beatrice to be so far removed from their previous pairing of Angel‘s Wesley and Fred, that you never make such a comparison whilst captivated in their world. Likewise his performance as Claudio proves that Fran Kranz is more than just the comedy of Topher and Marty he excels at in Dollhouse and The Cabin In The Woods respectively, and the lesser seen Reed Diamond does indeed shine when given the spotlight as Don Pedro. Whilst the bulk of the cast may be certified Whedon alumni however, there is still adequate room for newer faces such as Spencer Treat Clark (Gladiator, Unbreakable) who fit right in and gel with the rest of them. Perhaps the only recognisable performances come in the guise of Nathan Fillion and Tom Lenk, who here have both been in cast in roles they have played before. 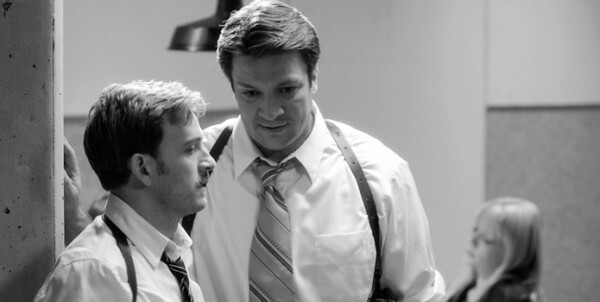 While Fillion manages to even out-hammer Captain Hammer as the obtrusive Dogsberry, cast opposite the quiet and unassuming Lenk’s Verges, the pairing of the two as the traditional Shakespeare comedy duo is a welcome treat which make us laugh, but have cleverly been given just enough screen time to make sure they don’t outstay their welcome and become too much of a destraction. Fillion and Lenk will be familiar to anyone who has seen their other Whedon appearances. Despite this lovable double act, and spot on slapstick that is occasionally seen throughout, the film’s label of “comedy” sticks mainly to it’s Shakespearean polar definition of ‘has a happy ending’ (in contrast to his tragedies which ‘have an unhappy ending’) and again may not live up to mainstream expectations of ‘makes you laugh the whole way through’. But where the film may not get you roaring with laughter however, it will undoubtedly have you ensnared in it’s charm. As it’s setting no doubt indicates, Much Ado is an intimate film giving us an important snapshot of the lives of a select few. Whole characters have been left out during Whedon’s abridging of the script, and as such the limited screen time is concentrated more on those that remain, allowing the two couplings of Beatrice & Benedick, and Claudio & Hero to both have their moments, although the reasoning behind Sean Maher’s Don John getting between them is perhaps somewhat unclear. Either that or I was just too distracted when he was possibly explaining his motive (let’s just say he had his hands full at the time). All in all Much Ado About Nothing is a refreshing welcome not just from CGI laden Hollywood blockbusters, but also from Whedon’s own sci-fi/fantasy back catalogue. Whilst metaphor is something he obviously does well, stripping away that extra layer leaves these characters bare for all to see as we are shown their love, heart break, and inner most thoughts. Perhaps the only negative to this film is that it has raised the bar too high, and introduced a new audience to Shakespeare who will not be able to find another adaptation to match, as the result of Whedon’s work is a subtle film which makes sure that anyone who finds the idea of it appealing, won’t be disappointed.